You won’t need to venture far to find something to do during your stay, because you’re only steps away from the Eclipse Centre and pure adventure! The equestrian and activity centre near Kenmare, Co Kerry includes eleven magnificent stables, with horses and ponies suited to all the family, an outdoor all weather arena, off road trekking, military assault course, team building, raft building, and fly fishing on a private lake or river, Mountain biking, archery and more! After a day horse riding through the spectacular Blackwater countryside you can enjoy a luxurious spa, sauna and steam room. The Eclipse Centre is located along the Ring of Kerry, amidst stunning scenery of the McGillicuddy Reeks and nestled between the colourful and cultural towns of Kenmare, Sneem and Killarney set in the heart of the lush and rugged Irish countryside. Each of the five spacious holiday homes at the Eclipse Centre offers a relaxing, contemporary design defining a well-appointed living environment whilst maintaining charm and distinction. Each unit is custom built, the properties are designed to exceed the needs of the modern family and are furnished with all the conveniences of modern life. All houses are light and airy with porcelain tiled or oak flooring covered with beautifully coordinated rugs. The well equipped large kitchen and dining area features walnut units, oak dining tables and leather dining chairs, with French doors to a private patio. Relax in the lovely bright living rooms which are tastefully furnished with comfy leather sofas, flat screen TVs with satellite stations, DVD player and hi-fi system. 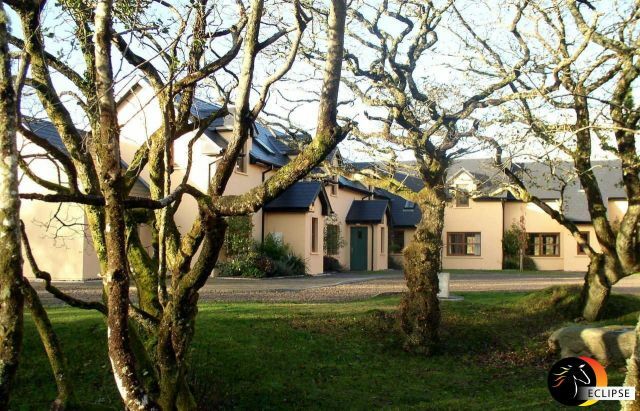 The Eclipse Centre offers you a family holiday with peace, relaxation, adventure and fun in a beautiful and tranquil setting. A sauna, steam-room and Jacuzzi and walks through the estate’s woodland and gardens mean you can combine a wonderful leisure experience with a multitude of activities to suit all the family. • Please note that the holiday homes are not equipped with washing machines or dryers. Launderette washing and drying facilities are available free of charge next to reception.